Greenwalker is a small initiative that aims to spread awareness in Bonn on sustainable consumption. It intends to motivate people by showing examples of small steps everyone can take that can make a big difference on the planet. Experts on topics such as sustainable nutrition, fashion, mobile phones, transport, as well as others, host Greenwalks around the city of Bonn every 4th Saturday of the month. The Bonn Sustainability Portal decided to join a walk to learn more about the initiative and share the knowledge with the local community committed to sustainability. 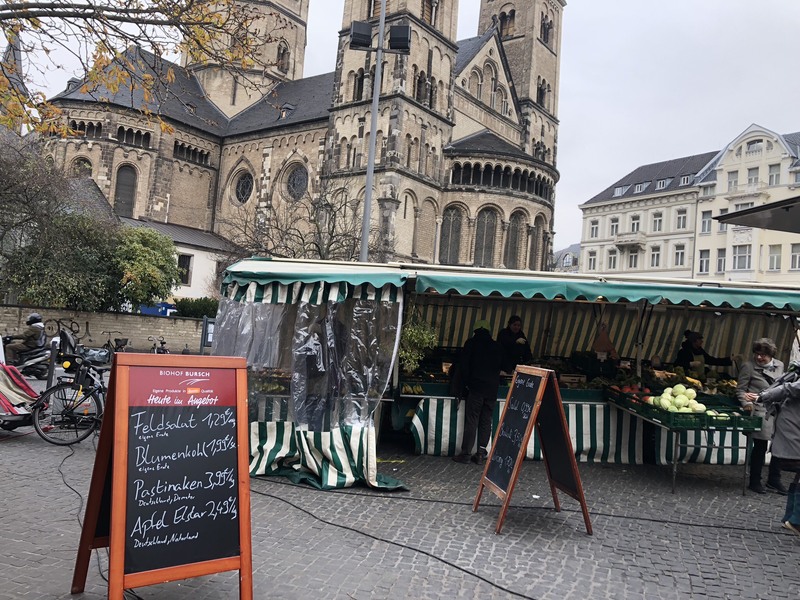 On a Saturday morning in late October, Francis Hugenroth hosted a Greenwalk on the theme “Climate Protection on a plate” that covered many different aspects of sustainable nutrition and how it can be implemented in Bonn. To kick off the Greenwalk, we looked at a world map that showed a more accurate representation of the continents: a much smaller North America, Europe, Russia and China, and on the other hand, a much larger South America and Africa. It was interesting to note how our perceptions of the world have been distorted by the conventional maps that the West created. We placed little figures on the map that represented the population of a country to demonstrate the population density and then learnt the average meat consumption per person in different countries. On average, German people consume 59kg of meat per year whereas Indian people only eat an average of 4kg a year. In the United States, the average person consumes a staggering amount of 100kg of meat every year. This highlighted the disproportionate ratio of average meat consumption per person with the population density in the US, and therefore the dire need for diet adaption to combat climate change. Francis Hugenroth then explained in more depth the severe impact that production, processing and transportation of food can have on the environment. As an example, we examined a food production process that begins in Brazil and ends in China. There is a huge demand of soy beans to feed livestock and Brazilian forest land is torn down to produce soy beans. The soy beans are then transported to pig farms in Germany to feed the livestock. The meat manufactured here is transported to China where pork meat is in high demand, and continuously rising. As a result of this entire process, we see deforestation of the Amazon, excessive amounts of air pollution from transportation across the oceans and continents, high carbon dioxide emissions from the animal farms and processing, as well as the other well-known negative effects of animal agriculture. The next discussion was about the importance of securing the sustainability of small farms which make up 75% of farms worldwide. In recent years, small farmers have become dependent on big companies for their harvest seeds. These seeds only produce one harvest, so small farmers need to repeatedly buy seeds. Many of them have to take out loans from the large companies to afford to do so. Small, organic farms are not only more sustainable, but also more efficient as the soil quality is better when the crop is diversified. A state in India, Sikkim, started the ‘Sikkim Organic Mission’ in 2010. It aimed at converting Sikkim into a state where only organically grown certified seeds, bio-pesticides, bio-fertilizers, organic manures etc. are used. In 2016 the prime minister declared Sikkim to be an ‘Organic State’. We discussed how this initiative from the regional government in India should be implemented by governments around the world and what a positive impact it would have on organic production of food and the farmers. The Greenwalk brought us to the Ökomarkt, the organic market found next to the Münsterplatz, where a range of fruits, vegetables, meat, dairy and baked products are sold. Francis Hugenroth reiterated that organic farming uses no artificial pesticides and fertilizers and emits significantly less nitrogen and CO2 into the atmosphere than conventional farming. The cycle of organic farming encourages biodiversity and gives soil the opportunity to recover from previous harvests. We then discussed the impact of local and seasonal eating and how this can significantly reduce the amount of CO2 released into the atmosphere. Eating foods that are produced far away means high emissions from transporting the goods and eating foods out of season means CO2 emissions from the greenhouse production. Although this is not always possible to avoid as mangoes and avocados are never going to be in season in Germany, it is good to be aware of and to buy local and seasonal when one can. Food production and transport make up 25% of the total C02 emissions, so if everyone made a few good choices a week on their plate, it would significantly reduce the pollution of the environment. The Ökomarkt is open on the Münsterplatz every Wednesday and Saturday, from 8:00-14:00. The final stop of the Greenwalk was at the Fair-Trade shop, CONTIGO, found on Wenzelgasse street. Francis Hugenroth stressed that organic food is not necessarily Fair Trade, nor vice versa. Small farmers see a very small percentage of the profits made from their products and can be trapped in a cycle of poverty and exploitation. The Fairtrade organisation ensures that small farmers see a fair amount of the profits, for example 28% for cocoa. They also continuously support the farming communities by enabling them to be independent and improve their quality of life through education and facilities. Responsible consumption on your plate goes beyond environmental aspects- a holistic approach that considers animals, humans, the environment is what the world requires. To wrap up the Greenwalk, we sat inside CONTIGO shop and enjoyed a Fair-Trade coffee and reflected on what we learnt and taught each other. When asked what her number 1 recommendation for people who want to be more sustainable citizens, Francis Hugenroth said to simply just start. She said, “Do not set goals that are too high-focus on what you are passionate about or on a change that is important and easy to make for you. For example, start with a meat free Monday. Another recommendation is to connect with the community- you will be inspired by the likeminded people around you and be encouraged to take another step in your journey.” Her motivation to be a Greenwalker ambassador is to spread awareness on sustainability and help inform people on the impact their daily choices make. Another motivation is to meet interesting people from all around the world that are passionate about sustainability and teach her things in return. This makes the Greenwalks exciting, dynamic and valuable for everyone. Greenwalker is currently looking for volunteers that are passionate about sustainable consumption and want to share their knowledge with others in the community. If you are interested in sharing your knowledge with fellow Bonners, visit the Greenwalker website and make contact with their team of ambassadors.